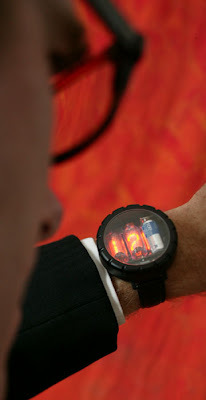 "The Cathode Corner Nixie Watch displays the time on nixie tubes, which are quaint neon display tubes once used in calculators in the dawn of recorded history (1969). It is a two-digit wristwatch designed for everyday use, being water-resistant and rugged. The watch requires no button pushing to operate - it shows the hours, minutes and seconds in sequence at the flick of the wrist." I've wanted one of these since seeing Steve Wozniak wearing one. Don't you have to change the batteries in these about every 2 days?